The King Critter is the ultimate predator decoy that was built to handle extreme conditions. With erratic motion from the magnetic decoy, it is bound to bring in any predator. The King Critter has 2 speed settings for the decoy, and includes a tripod stand perfect for any terrain. There is also a 3.5mm port compatible with most e-caller remotes with auxiliary function. Runs on 4 AA batteries (not included). The Crippled Critter imitates an injured critter flopping around on the ground. The decoy moves erratically and then drops out of sight for a slight second and then reappears with its erratic motion. This movement entices predators curiosity and draws them in close. The decoy features a quick attach adapter for easy storage and a ground base to set on any terrain. There is also a 1/4-20 thread on the decoy base to attach to a tripod (sold separately) or other stake system allowing the decoy to be elevated and used as an injured bird decoy. A 3.5mm port allows the decoy to be controlled by most e-caller remotes with an auxiliary function. Runs on 4AA batteries. Predators kill for skunks & kittens. 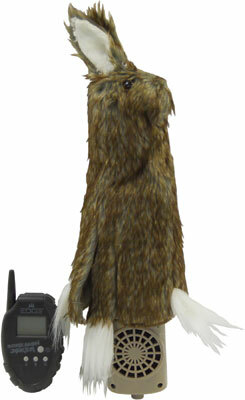 The Lucky Duck Quiver Skitty is a close relative to the Nations #1 best selling Quiver Critter! The proven "Quiver & Shaking" motion along with a never seen before decoy cover will result in up-close & personal action. This decoys comes with a 9" steel stake-great for that hard terrain. Requires 2 AA batteries (not included). Endorsed by Rick Paillet-"Verminator"
The Lucky Duck Lil' Critter offers an erratic decoy motion to entice all predators. Simple-portable-effective. The decoy adjusts in height from 10" to 18" off the ground-great for having it seen just above the field grass. The decoy base rest on any terrain, no stakes to pound into the ground. Compact-fits into your pocket. Quick setup. Requires 4 AA batteries (not included). Nation's #1 Selling Predator Motion Decoy! You gotta have this one! Effective motion decoy provides realistic quiver and shaking movement that is irresistible. Quiet and easy setup. Now comes with upgraded 9" steel stake for that tough terrain! The Quiver Critter now comes with universal tripod threads for optional use in the field. Requires 2 AA batteries (not included). The Joker is a remote controlled premium decoy featuring variable speed control. The random left to right twisting motion creates a deadly predator decoy. Remote range over 300'. This decoy setup includes a pocket fob remote control, heavy duty motor, steel stake with universal threads. Requires 4 AA batteries (not included). After trying many versions, MOJO Outdoors has developed the most effective predator decoy on the market. 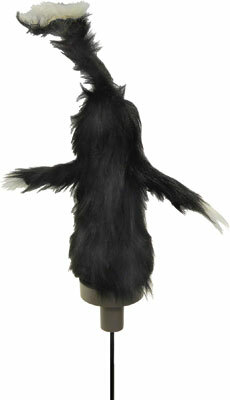 The MOJO Critter predator decoy is light-weight, portable, simple and affordable. It has highly visible and tantalizing action using realistic prey-type fur that immediately attracts and holds predators' attention. Intermittent, cyclic action for added realism. It calls 'em in and diverts their attention away from you. The MOJO Critter is proven to work on all predators and will greatly improve your success. Operates on 4 AA batteries (not included). Note: MOJO Critter is not remote capable. The MOJO Super Critter is truly a case of the “Best Getting Better”. The MOJO Critter proved to be the most effective and the most popular predator decoy ever, and revolutionized the use of decoys in predator hunting. Now, MOJO introduces the Super Critter using the same tantalizing motion but in a more advanced decoy. Includes magnetically connected Critter topper, built-in disappearing tri-pod legs plus MOJO Peg with 1/4” camera thread gives multiple mounting options; super tough ABS housing; provided with MOJO Cottontail sound, 3-way switch that allows motion only, or motion plus sound. Decoy is specially designed to allow on/off control from most remote callers that have 3.5mm auxiliary port (requires common 3.5mm double male chord available as accessory). Operates up to 20 hours on 4 AA batteries (not included). Convenient wireless removable battery holder stores in recess with easily removable cover. Realistic removable fur cover. 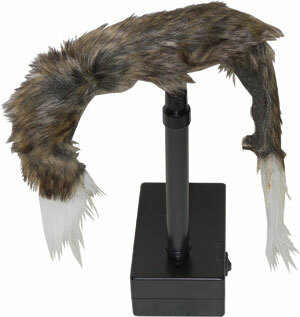 The MOJO Hawk predator hunting decoy was developed to add another dimension to predator calling. It is used by placing the hawk above a wounded prey decoy and an electronic caller to give the predator the sense that a bird of prey has either wounded or found a wounded prey and is about to make off with it and if the predator wants the easy meal, he needs to rush in. Predators, especially coyotes, have a tendency to hang up a couple of hundred yards out, then maybe circle downwind to come in. The wounded prey decoy alone adds realism to the set up, and keeps the focus of the predator on the decoy and off of you, the caller/hunter; especially when the sounds are placed at the decoy. However, it does nothing to give the predator a sense of urgency that prevents him from traveling downwind and getting your scent. This is especially important in heavy cover. Also, predators are known to watch birds of prey because of their aerial ability to find wounded prey, thus leading them to an easy meal. 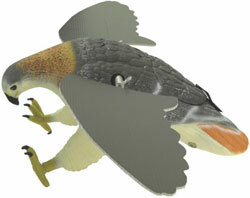 The MOJO Hawk is especially designed to simulate a hawk in a fighting mode as if it had wounded or found a wounded prey and adds great realism to the set up. Complete with standard MOJO 6 volt rechargeable battery and equipped with standard MOJO breast peg and mounting pole. This site was created by: Up North Outdoors Inc.